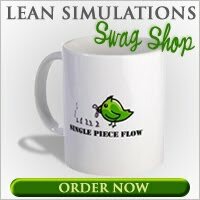 This blog post has nothing to do with lean. I stumbled across this video and after half an hour of mesmerizing folk dancing, I just had to post it. Like most engineers, I've had some rudimentary computer programming training. But I don't recall ever learning any sorting methods. After watching these videos, I feel like a sorting expert. I've never even heard of these techniques (merge sort, quick sort, shell sort, etc). Sorting seems like really dry computational stuff. Unless you add traditional folk dancing!! Please don't watch this video unless you have half an hour to kill. There's a series of videos and you'll have to watch them all. After a minute or two of tap dancing, you'll be hooked. At first I just watched the dancers, then I needed to figure out the pattern. Then I had to watch it again. Then I had to watch the next one. Besides learning about computational sorting, there's some merit to these videos. After all, this blog is about training techniques and the following videos are definitely a unique training method. It's something you'll never forget. What unique teaching methods have you used to teach lean or other things?